Proteinuria is common after kidney transplantation and typically urine protein levels are below 500 mg/d. However, even these low levels are associated with reduced graft survival. Most allografts with proteinuria >1500 mg/d have new glomerular pathology. In contrast, lower levels of proteinuria are generally associated with nonglomerular, nonspecific histologic changes. The relationship between proteinuria and graft survival is independent of other variables, including graft function and graft histology. Thus, proteinuria allows stratification of risk in patients with or without glomerular pathology. Proteinuria should be monitored periodically posttransplant and investigation of the cause should be pursued vigorously. Allograft glomerular diseases causing high-grade proteinuria are associated with reduced kidney allograft survival.1 More recent studies show this relationship extends to lower levels of proteinuria that may or may not be associated with glomerular pathology.2,3 Investigating the cause of posttransplant proteinuria is complex because after transplantation proteinuria may originate from the allograft or from native kidneys, may be due to various allograft pathologies, and/or may be a side effect of immunosuppressive medications. Thus, stating that proteinuria relates to graft survival is an oversimplification of the issue because among other variables, the cause of the proteinuria likely has an effect on that relationship. 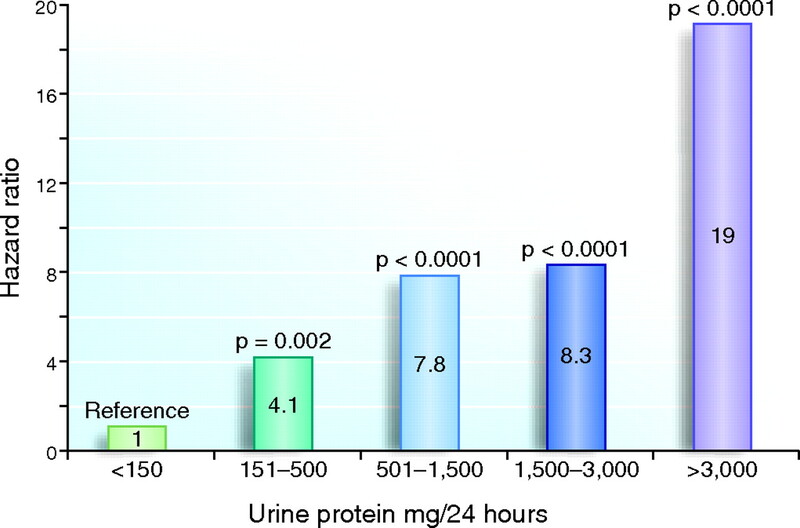 Still, these observations emphasize the importance of monitoring urine protein excretion posttransplant,4 investigating the cause of even low levels of proteinuria, and considering therapy. The first consideration in evaluating post-transplant proteinuria is whether it originates from the native kidneys or from the allograft. An increasing proportion of patients do not receive dialysis before transplantation and those individuals may have proteinuria due to their native kidney disease. Recent studies show that pretransplant proteinuria declines promptly after successful kidney transplantation.5,6 On the basis of examination of protocol biopsies, one of these studies provided guidelines to determine the origin of posttransplant proteinuria.6 First, in patients with well functioning grafts, proteinuria >3000 mg/d 3 wk posttransplant cannot be attributed to the native kidneys even if the patient had nephrotic-range proteinuria pretransplant. Second, proteinuria greater than 1500 mg/d 1 yr posttransplant and/or an increase in proteinuria from 3 wk to 1 yr >500 mg/d is indicative of new allograft pathology.6 Third, native kidneys may contribute low levels of protein (<500 mg/d) to the urine of transplant recipients even 1 yr after transplantation.6 However, native kidney proteinuria is expected to decline over time after transplantation. The second issue to consider is the type of allograft pathology causing posttransplant proteinuria. In assessing this question, our group studied protocol biopsies taken 1 yr after transplantation from 613 transplant recipients who also had urine protein studies.3 It is important to note that in those studies the classification of allograft pathology deviated from the Banff classification in that the diagnostic term “chronic allograft nephropathy” (CAN; i.e., the presence of interstitial fibrosis and tubular atrophy) excluded allografts with any type of glomerular pathology, except global glomerulosclerosis. This approach is justified by two observations. First, some forms of allograft glomerular pathology, such as transplant glomerulopathy, may be associated with CAN but it has distinct pathogenesis, clinical presentation and prognosis.7 Second, other forms of nonrecurrent glomerular disease, such as focal segmental glomerulosclerosis, are rarely present in patients with CAN and when present defines a subgroup of patients with a distinct clinical presentation and prognosis.8 These studies3 show that 1 yr after transplantation proteinuria is present in 45% of recipients although in two thirds of them the protein excretion is below 500 mg/d. Compared with patients without proteinuria, those with proteinuria have a higher incidence of glomerular diseases in the allograft (1.2% versus 18.8%, P < 0.0001). In contrast, the incidence of CAN is similar in patients with or without proteinuria (45% versus 46%). Eighty percent of patients with proteinuria >1500 mg/d had allograft glomerular pathology. In contrast, lower levels of proteinuria are associated with multiple pathologies, including incipient glomerular diseases. Of interest, albuminuria is detected in 20% of patients with normal protein excretion (below 150 mg/d) and virtually in all patients with proteinuria above this level.3 Thus, posttransplant proteinuria is quite common and even low levels of protein in the urine are associated with significant allograft pathology. However, that pathology is often nonglomerular and nonspecific. There is a strong association between proteinuria and reduced graft survival. For example, 77% of allografts lost within the first 5 yr posttransplant had proteinuria at 1 yr.3 Those studies and others also show that proteinuria provides prognostic information beyond that provided by measures of kidney function, histology, and other variables associated with graft survival. Relationship between increasing levels of proteinuria at 1yr posttransplant and subsequent graft survival. In absolute terms, 3.9%, 9.9%, 20%, 33.3%, and 41.2% of kidney allografts were lost during a period of 46 ± 20 mo of follow up in patients who at 1 yr had proteinuria <150 (n = 337), 151 to 500 (n = 182), 501 to 1500 (n = 50), 1500 to 3000 (n = 27), and >3000 (n = 17) mg/d, respectively. An aggressive approach to diagnosis is justifiable by the poor prognosis of allografts with proteinuria; however, the data suggesting that treatment alters allograft survival are lacking.15 These data are indeed available for several native kidney diseases supporting our recommendation that antiproteinuric measures be applied liberally to transplant recipients with proteinuria. These measures should include blood pressure control (to systolic pressure <130 mmHg), the use of the maximum tolerable dose of an angiotensin converting enzyme inhibitors and/or angiotensin receptor blockers (ARB), lipid control preferably with a statin, nicotine cessation, and achieving and maintaining an ideal body weight. In our clinical experience, inhibition of angiotensin II is effective in reducing posttransplant proteinuria. However, angiotensin converting enzyme inhibitor and angiotensin receptor blocker therapy can cause significant anemia, hyperkalemia, and allograft dysfunction. Thus, we suggest these drugs be started at low doses and that potassium, hemoglobin, and creatinine be monitored closely while drug doses are increased. It is our practice to discontinue SRL in patients with proteinuria greater than 500 mg/d or with glomerular disease. When lower levels of proteinuria are present we recommend discontinuation of SRL only if proteinuria increases during follow up. In our clinical experience and others,11,12 SRL can worsen preexisting proteinuria. Thus, if upon discontinuation of SRL proteinuria does not normalize an evaluation for the causes of the proteinuria should be undertaken. Proteinuria is a useful prognostic marker after kidney transplantation adding information beyond that provided by other demographic, biochemical, or histologic variables. Proteinuria identifies recipients with glomerular diseases that may cause graft failure. In patients without demonstrable glomerular pathology, it is unclear whether proteinuria is due to focal glomerular disease not seen in the biopsy or is indicative of progressive proximal tubular dysfunction. These possibilities deserve investigation, not only to better understand the prognostic implications of proteinuria, but also to investigate possible effective therapies.